Being a newlywed is a very exciting phase of one’s life. With passion and romance, the moments are filled with mystery, wonder, and dreams about the future. And often, the dream of owning a home together dominates all other dreams. Today’s story is about a young newlywed Korean couple who inherited an old and dilapidated apartment from an elderly couple in ultramodern and fast paced Seoul. 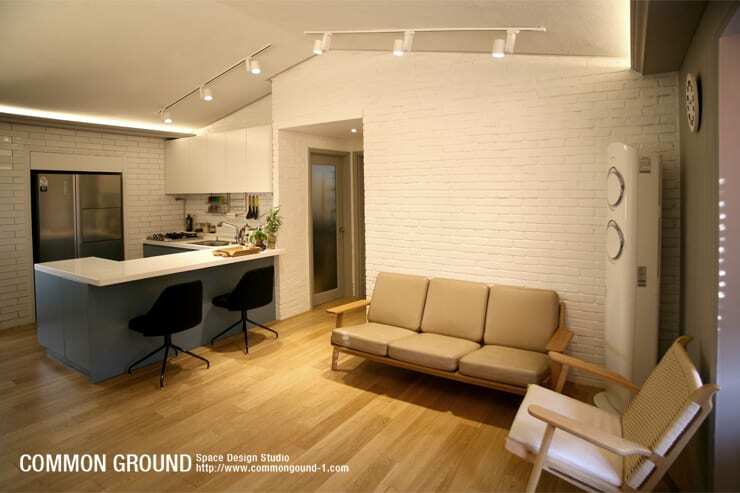 In Korea, it is common for couples to buy older flats, as it fits their budget and can be modified according to their taste. Villa 15PY is also one such apartment that was once gloomy and drab with almost zero aesthetic charm. 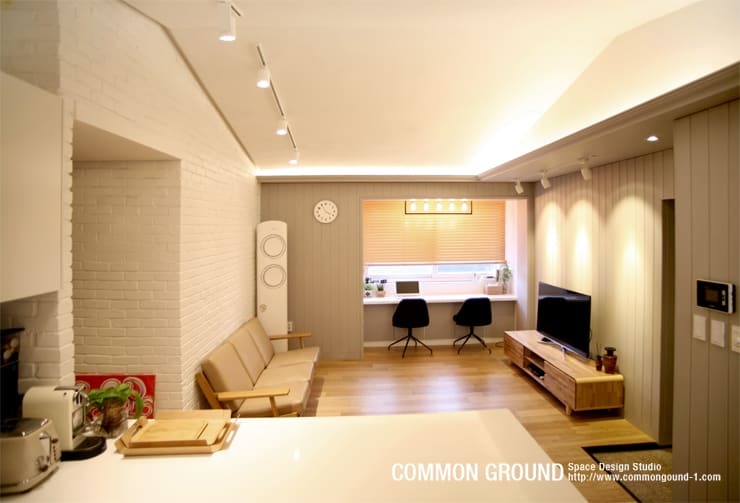 But the interior designers and decorators at Common Ground transformed it into a contemporary, stylish and comfortable living experience. 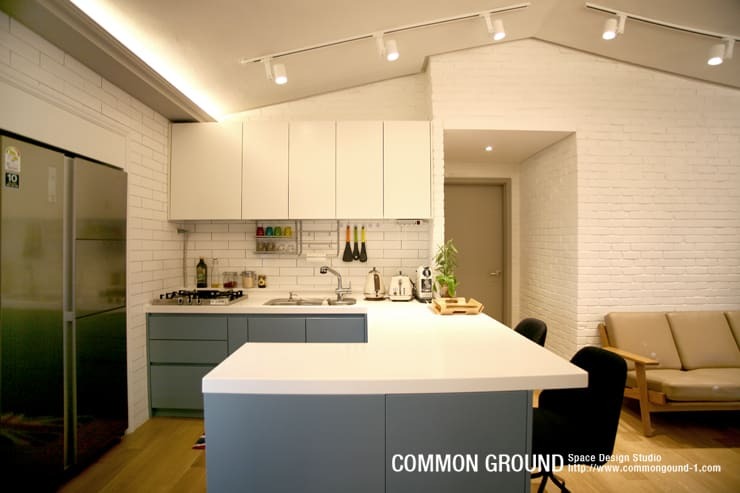 The cozy and smart home now flaunts the timeless blend of white and wooden hues, an open plan layout, contemporary designs, and minimalistic but comfy furnishing. The kitchen was old, shabby and promised hardly any cooking joys. 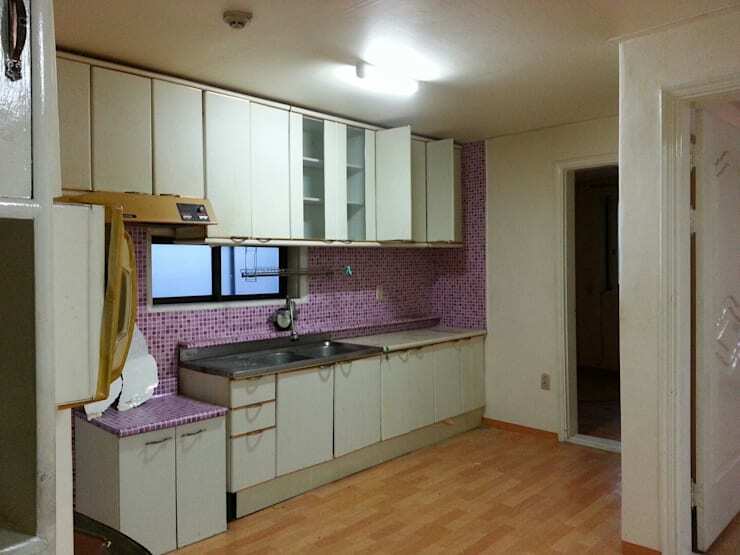 The cabinets showed dirt and grease and the mismatched purple tiles were an eyesore. This came as a dream come true for the young couple. A comfortable living area with an open plan kitchen is now overlooked by powerful ceiling lights which brighten up the area and enhance the crispness of the white brick finish walls. The minimalistic beige sofa set complements the elegant wooden flooring, while the kitchen beckons with its snazzy grey and white counter. The revamped kitchen wows us with its sleek and modern design. The bluish grey counter looks spectacular here and contrasts the gleaming white countertop nicely. The kitchen not only looks smart but is also well equipped for a passionate chef, with hooks and racks on the brick finish backsplash for organisational ease. A pair of revolving chairs on the right of the counter ensures that cooking will be an enjoyable interactive experience for the chef. What better place to relax after a hard day’s work than this simple yet classy living room. The rectangular sleek TV cabinet looks perfect in the room with brilliant lighting and beige striped walls. A distinct feature here is the small work area set up by the large window, which can be used for dealing with pending official work or enjoying some quiet reading. 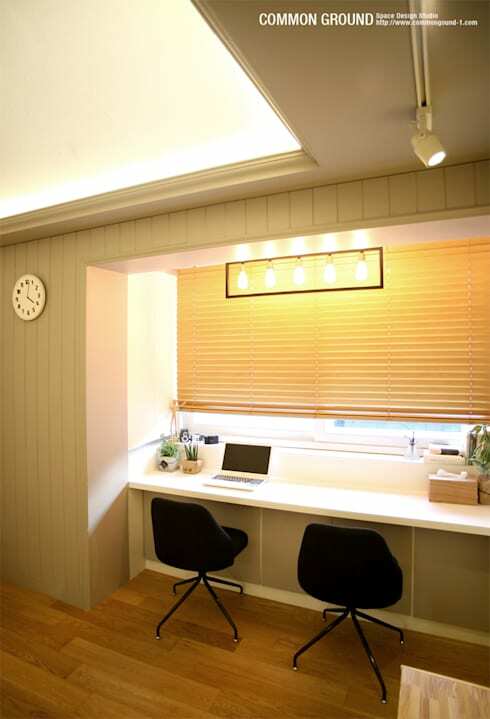 No one would ever believe this was the space which is now transformed into a work area. Not only was this space a total waste, it appeared to be unpleasant, ill-maintained and dirty. 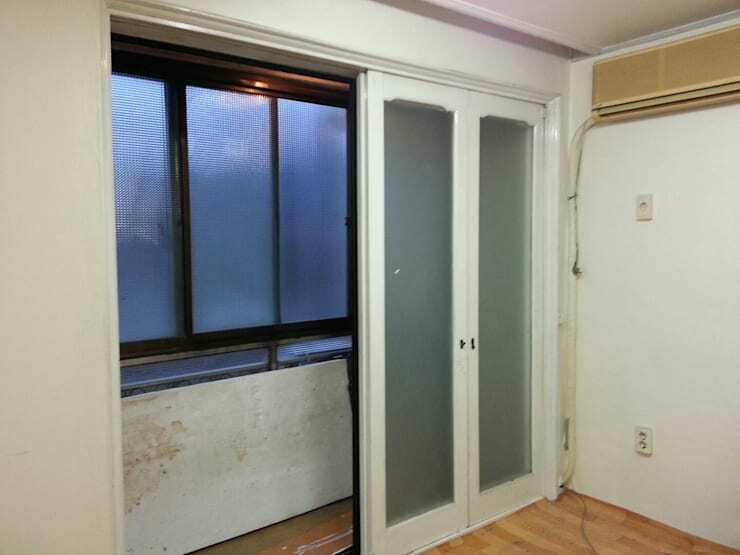 The sliding doors were completely unnecessary and hindering the proper utilisation of this nook. The nook is now a great attraction with the sliding doors gone, and allows natural sunlight to filter through the glass window once the blinds are raised. Potted plants add a natural feel, while the wall-mounted desk and modish seating ensure comfort and utility. 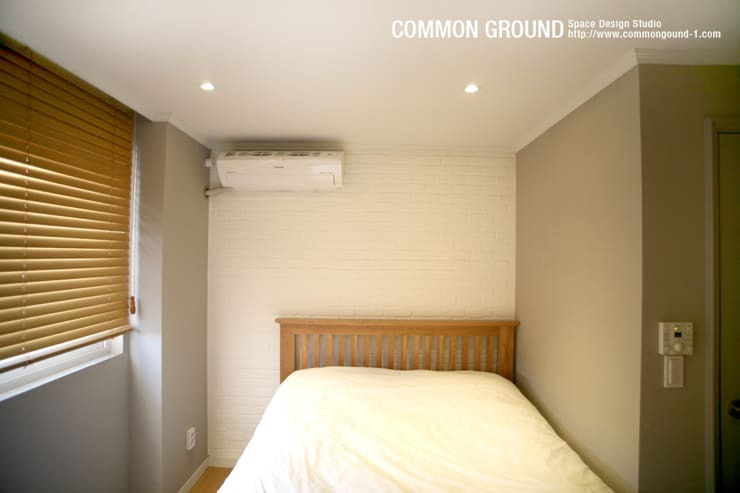 The bedroom has been kept simple and minimalistic, with a sleek but comfy bed taking the centre stage. However, the combination of grey and white walls lends an elegant personality and flair to the space. The room is well lit with artificial lights as well as natural light through the glass window. Now, this is what we call a stylish bathroom. With all bathroom essentials stored inside the mirror cabinet or arranged on the sleek black ledge, this space looks truly impressive. 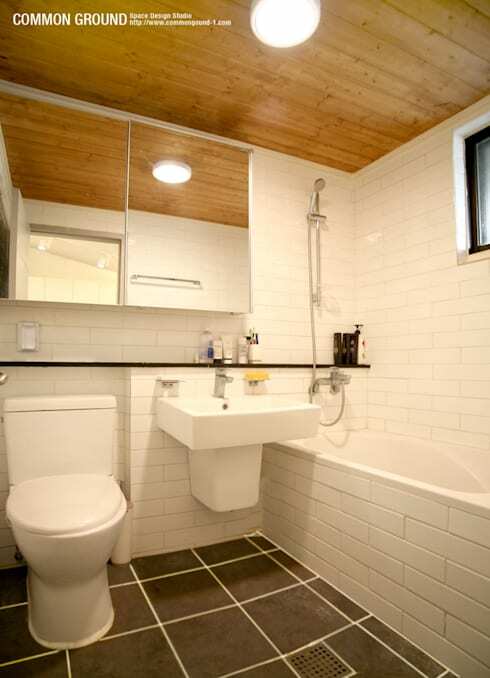 The bright lights and wooden ceiling are unique and trendy, while the modish sanitary wares promise cosy utility. The large brown tiles on the floor contrast the sleek white tiles on the walls and around the tub for a chic and smart look. This apartment is now perfect for the Korean newlyweds to embark upon a bright and happy journey, and match step with modernism. Here's another makeover story for more ideas - The Glorious Beauty of an Urban Chalet.